As I looked at the very same dress, I thought of Saint Laurent, his muses and their influence on the 1970s fashion and style, so instead of solely looking at Fall/Winter 2015 collections, I decided to seek inspiration in the designers work and Loulou de la Falaise for she definitely knew how to channel bohemian vibe to perfection. I used a lot of jewellery - much more than I'd dare to wear myself until this very moment. Loulou had baskets of beautiful costume pieces, always wore at least one statement accessory and was amazing at playing with scarves and layers. I was thinking of her while working on this outfit as well as Saint Laurent, of course - for me the two are very much inseparable. 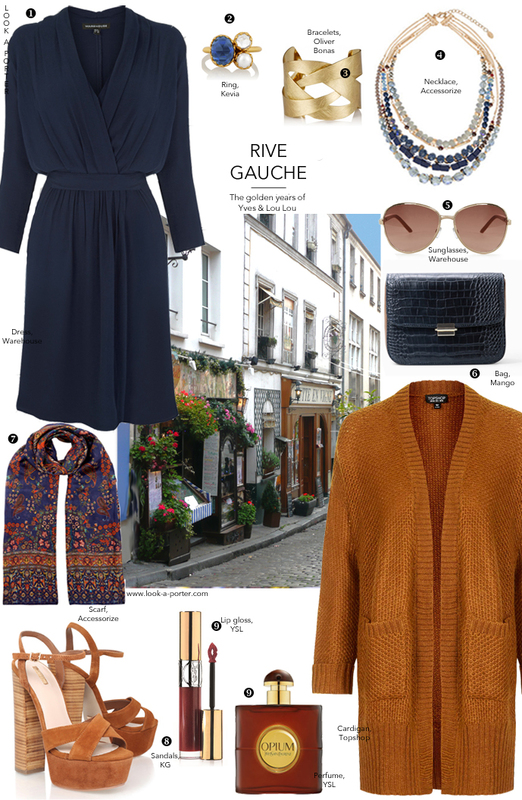 I think this outfit is such a perfect idea for a day off, coffee with friends and, if you are lucky enough to find yourself in Paris, a wonderful walk in Le Marais. PS: I am sorely tempted to buy every piece! Love this shoes and jewelery by dress,uitstanding good post again!